It’s 2001. Retreat time at Osel Ling Centro de Retiros in Granada, Spain. 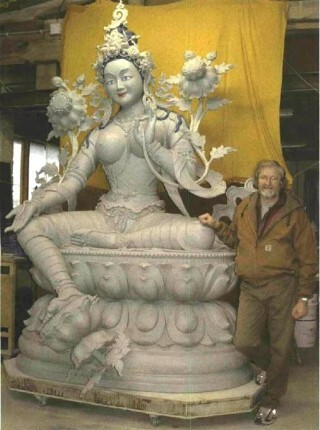 Lama Zopa Rinpoche asks artist Bertrand Cayla to create a large statue of Green Tara for one of the hillsides at the center. Little does he know what lies in store. When Lama Zopa suggested this project, I was surprised to say the least, because I had no real experience of building such a large statue (more than three meters in height), but at the same time, I was really curious to see what the result might be. I felt that if Lama Zopa was asking for it, there must be a good reason. I didn’t know, though, that it would be such a task … and today, although the statue herself is ready, until it is cast and delivered, it’s still not finished. Even though there were many modifications to be made, by trying to follow the recommendations of Lama Zopa I saw the statue starting to become really nice. At one stage, I really didn’t want to make the changes: I even said ’no,’ although later I did as Lama Zopa asked — and didn’t touch the statue again for nine months!